After going to a main-pedi party for a girl in her preschool class last year, Isla chose to have a mani-pedi party herself. It was a really sweet time, and was super simple for me, given I didn't have to decorate at all or even do any games! I brought doughnuts for the girls to enjoy while the others were getting pampered, as two girls went at a time. Then, when the last two girls were being done, Isla opened her presents.I started to say super simple again, but have you ever seen six little girls pick out a color for their nails? It's serious business, I tell you. One that involves a lot of mind changing, a lot of looking and perhaps even some dropping of bottles on the ground. Isla ended up going with pink sparkles, which most of the girls ended up getting sparkles of some sort. It's popular, I tell ya! The girls laughed, they giggled, they bounced around and talked about crazy things. Isla really enjoyed herself, and for that, I am thankful. 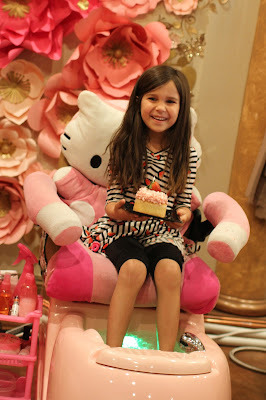 ^^ The salon brought out Isla a little cupcake and everyone sang her happy birthday while she was getting her toes done. I leave you with what may be the cutest video of all time...Isla squealing with laughter as her feet are being scrubbed because it tickles.